​(all enrolled families must have one Main Form filled out. ​use the button to the left to fill out a schedule change request form. Adi loves the younger babies. Whenever she finds a moment to care for them, she is there. On Thursday after lunch, Adi watched Esther in her bassinet and took this opportunity to rock her. Esther just loved it and showed her appreciation to Adi with big smiles and coos! I loved this special moment of relationship between these girls and took a photo. As I took out the camera, Esther shared her joy in this special moment with me. 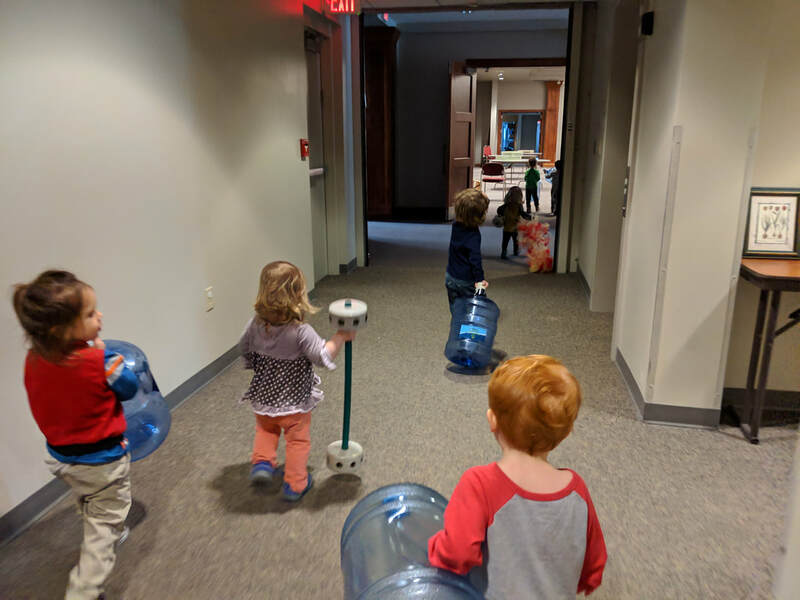 Toddlers and K2 Children bringing props to prepare for our circus! At Mequon Jewish Preschool, we partner with children and families towards a holistic educational life approach; dedicating ourselves to the well-being of each child and family, with a special focus on igniting the spark of Jewish interest and excitement. We follow the Rebbe's vision of education being about building a character with emphasis on moral and ethical values, and the Reggio Emilia approach, the leading best practice around the world since 1963. Our curriculum uses a seamless and joyful approach; Jewish identity, traditions and Mitzvot, knowledge about Israel, integrate with academic skills and thematic deeper knowledge. These are all explored and discovered through an in-depth research based experiences. If you would like to be notified of Challah Sales via email or text, please follow this link to be put onto the new Remind Challah List. This is the only way to be notified and to order.